I first discovered Tropic of Cancer a few years back. Hard to say now whether it was through a Youtube link from a friend or just by accident. I'm trying to dig into memories, but that particular moment doesn't come up. just by accident. Why is the source of information important to me? Or why is it important in general? How did you get into this circle, how did you discover this band, or maybe how did the band discover you? It is a unique path for each of us, but I think that the source, the entity or the conjuncture of this amazing moment, when you find music and music finds you, this is important. Back to you my fellow reader. This is an astonishing album with some serious haunting melodies. Sadness, calm, clear headed introspected melodies flowing into waves of darkness. Although Camella says in an interview on Juno that she got tired of this idea of sadness and depression, goth and death. But there's nothing wrong with it; a friend of mine once said, when we were sitting in a train, that the most beautiful music is written when you're suffering from love, when you’re sad. Except for the last track, Rites Of The Wild, you can hear Camella Lobo's voice on each song from this album titled ''Restless Idylłs''. Released on the London record label Blackest Ever Black in late summer of 2013, this beauty comes out on vinyl on a double disc package, with an intriguing artwork - a hand with red nail polish coming from the right corner of the image, trying to reach a three arms chandelier with white roses on top. As you can definitely see in this picture here. I played the album a few times already, listening to each of the songs, in their very own track hierarchy. My favorites are ''Hardest Day'', ''More Alone'' and the darker ''Wake the Night''. Each of the songs breathes an unique presence and life, of its own. But be careful with it, it can cause addiction, for a while. 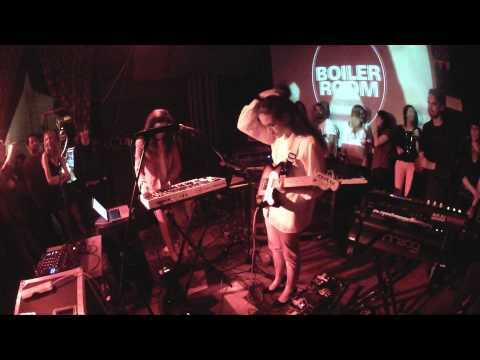 On my right is a nice concert for the Boiler Room, with most of the songs from the album, played live.